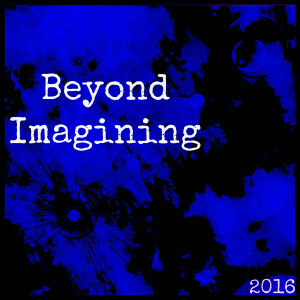 “Beyond imagining.” That was the message from my subconscious about 2016 when I awoke from a brief nap late this morning. I immediately recognized the phrase. It comes from the opening of Susan Cooper’s “The Dark is Rising.” In response to wild weather, strange behaviour of animals, and a tramp in the neighbourhood, Frank Dawson says “this night will be bad and tomorrow will be beyond imagining.” He also gives Will Stanton a strange present for his 11th birthday the following day, an iron circle with a cross. Will Stanton wakes the following day and walks into the past where he learns that he has a quest to find the signs that, united, can restore the balance between Light and Dark. The gift from Frank Dawson was the first. What might it mean that what I most need to tell myself about 2016 is that it will be beyond imagining? 2015 was rough, a year of transition, closing old doors, making new paths, shaping new spaces, creating new business models, opening new doors. I feel now, for the first time all year, that some things are starting to settle. Some routines have fallen into place. New roads lie before me. 2016 will be a year of walking into a world I have dreamed of, imagined, yearned for. And yet, as my sleeping self so wisely pointed out to me, what happens will be beyond anything that I have imagined. Will I find myself seeking the signs I must unite to restore balance between light and dark? Perhaps. I will certainly be gathering the threads of my past studies and putting them together to teach, write, and speak about how to live a whole-hearted, authentic, integrated life in the context of a world that often asks people to hide and pretend and live out of alignment. I will be applying knowledge I have accumulated through studying theatre, language, philosophy, religion, anthropology, biology, psychology, law, and education in my life, my family, and my career with the aim of bringing sanity, compassion, human connection, and deep thriving to people and communities that crave transformation. This has always been my quest. But things have changed for me in 2015. I have claimed my own inner authority and my accumulated wisdom and transformed myself. And, I had the insight that put all of the many things I have studied in perspective and brought them together in a way that is now calling for articulation. For the past 30 years, I have sought to answer the question “How must communities be created to allow individuals, especially individuals who fall outside the norms, to thrive within functional communities?” This fall, the answer resolved itself for me in a Eureka moment. And in that moment, my mission changed from seeking the answer to sharing the answer. And how I will do that is beyond what I have imagined during the seeking part of my quest. And where my path will lead from here is beyond imagining.